We are here to help you make a huge impact in the world through your Shower Strike fundraiser. Use this support page for our FAQ, sample social media posts, emails, and thank you's. This information will help you raise money quickly and get in the shower even quicker! If you have any questions or need help, email us at info@wellawareworld.org. Use this logo as your facebook profile pic to raise awareness and get people talking about Shower Strike. Simply right click the image, save it to your computer, and then upload it as your profile pic. WARNING: Participating in Well Aware’s Shower Strike may result in feelings of goodwill and accomplishment. Please use extreme caution in declining the opportunity to Shower Strike. What is a Shower Strike? 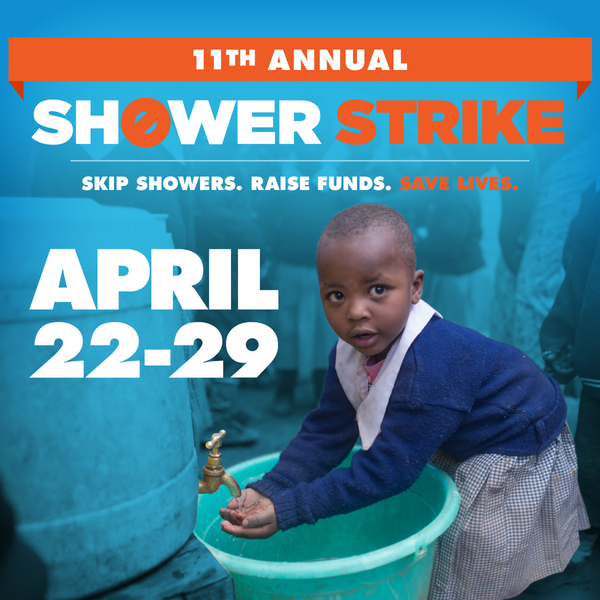 Shower Strike is a week-long fundraiser where participants skip showers in order to raise money for life-saving water systems in East Africa. We can help tens of thousands of people have clean drinking water for decades to come! Well Aware has a team of professionals and volunteers who are changing and saving lives in East Africa by installing sustainable water wells, pipelines and rainwater collection systems. While we are good at what we do, we need YOUR help to save lives by bringing clean water to those in need. Who takes part in this? We recruit individuals and teams from all walks of life! We’ve had marketing firms, interior designers, elementary schools, nonprofit organizations, football teams, doctors, lawyers, rotary clubs, teachers... you get the idea. Anyone who wishes to participate in Shower Strike, or simply just donate to the cause, is welcome! How does skipping showers raise money? Skipping showers is simply a way to raise awareness about the need for clean water in East Africa. Through Shower Strike, we’ve raised over $1,245,000 over the last 10 years and aim to raise $250,000 this year. That’s a lot of clean water that can make a huge difference! How do I get people to give me donations for not showering? By telling people that you are skipping showers for a week, you'll have the opportunity to explain why water is so important! All you need to do is tell people what you’re doing (via social media, email, telephone, carrier pigeon, etc.) and invite them to contribute. More tools available on how to do this below! Is it difficult to ask people for contributions? Nope. Our Strikers consistently tell us that they are surprised by how easy it is. Here’s why: We make everything digital and simple. You’ll have your own Shower Strike page and everything can be done online. Many people want to help others have clean water, and you just became the way that they can. Go you! By participating in Shower Strike, you'll know that what you are doing is changing the lives of individuals in East Africa. The money that you raise will provide entire communities with access to clean water, which in turn will decrease infant mortality rates, help girls obtain an education, and overall help people thrive. You will also get your name on a water well in Kenya if you’re the top fundraising individual or team. Other goodies during Shower Strike week include prizes for Strikers, special celebrity Shower Strikers, and more! This is amazing, how can I go on Shower Strike with Well Aware? 1) Create a fundraising page in five minutes at www.ShowerStrike.org, 2) Read below for easy steps on posting about your strike to get donations, 3) Shower when your goal is met, and 4) Rinse and repeat next year! Skipping showers isn't really my thing. How can I still be a part of this? We have glorious alternatives! 1) Fundraise without skipping showers. You could shorten your showers, reduce your water usage, or whatever works for you. So long as you're helping spread the word and having fun, we don't care how you fundraise! 2) Be a sponsor. We get a ton of website traffic during the strike, so this is an incredible opportunity for some meaningful advertising. 3) Donate! No contribution is too small and we are always grateful for those that are willing to give back. If someone wishes to donate with cash or checks, report those donations and we'll add them in your donation total on your page. To report these donations, send an email to info@wellawareworld.org with the following information: Donor name (email and address if possible) and donation amount (specify cash or check). - Feel free to share the posts from Well Aware's Facebook, Instagram, and Twitter pages onto your own pages.